Basiaeschna janata or the Springtime Darner is a dragnonfly that comes by its common name because of its early flight time which sometimes starts towards the end of April and the beginning of May - earlier than other "blue" darners of the Aeshna genus. 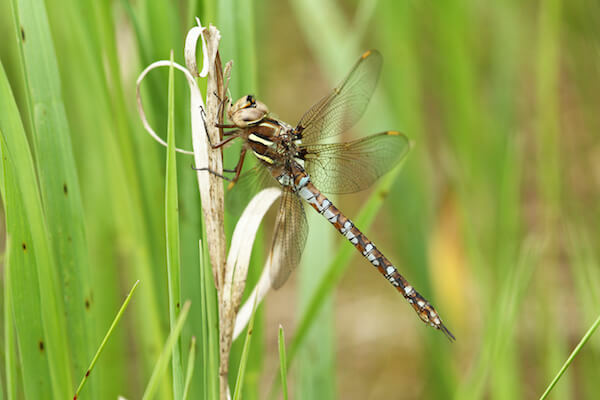 Hence, the springtime darner is the only species in the genus Basiaeschna. This dragonfly is characterized by small brown spot at the base of the wings in both the male and female, and side stripes on its chest (thorax) that are bright yellow or white. Males are distinguished by blue spots on the abdomen and more simple claspers. Females have longer, more narrow clasp appendages. The springtime darner is common in the United States and to Southeast Canada where there are gently flowing rivers and steams in forested areas, and can sometimes be found in clear ponds and lakes. It feeds on bugs over water where it does its mating and egg-laying. What’s the dragonfly’s connection to water? Dragonflies mate flying over water. The female will either lay the eggs on a water plant or drop them in the water. The larvae from hatched eggs are called nymphs. Nymphs look like underwater flies without wings. 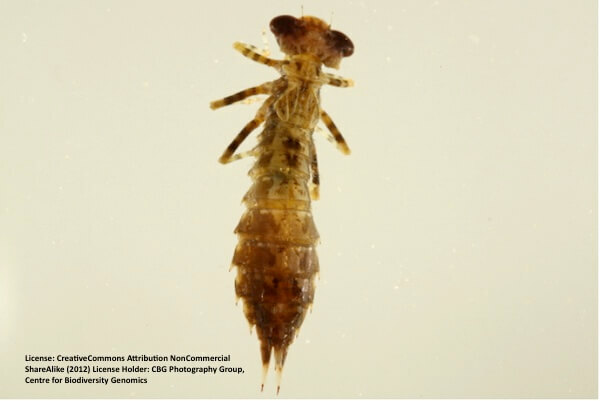 They live in the water developing for 2 to 4 years like this springtime darner nymph found in Georgian Bay. They eat other insects and larvae, other nymphs, worms, and small crustaceans. They are preyed upon by fish, frogs, birds, beetles, and other dragonflies. Once a nymph is fully developed, and the weather is suitable, the nymph will crawl from the water and shed its skin or exuvia, emerging as a dragonfly. Adult dragonflies only live for a short time which is about 2 months.